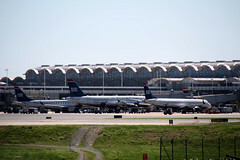 Two planes collided this morning on the ground at National Airport, causing significant damage to the departing plane. No injuries are reported at this time. It’s not clear how the collision occurred, but one of the planes had to cancel their flight due to the damage. More as details come.